I would have placed these priorities in exactly the reverse order since cheap reliable energy is the key to prosperity while climate change is of little direct importance for the UK economy. 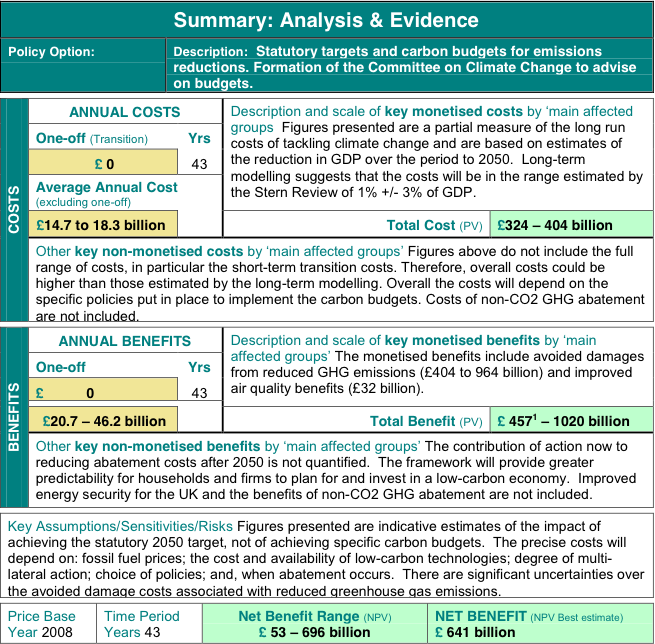 Meanwhile DECC is spending eye watering amounts of money “tackling climate change” as sumarised in their “Cost Benefit analysis” from 2008 (see fig 1). Spending this sort of money one would expect large long term benefits. The assumption seems to be that through example the UK will convince the world to abandon growth and cut carbon emissions to avoid planetary disaster. As I see it there are two basic problems with this noble position. For the UK itself there has been no discernable change in climate since 1940 and it is unlikely that significant change will occur by 2050 either. The evidence for this comes from the HADCRUT3 averaged temperature anomaly data for all UK stations from 1940-2011. The result is shown in Figure 2. There has been essentially no change. 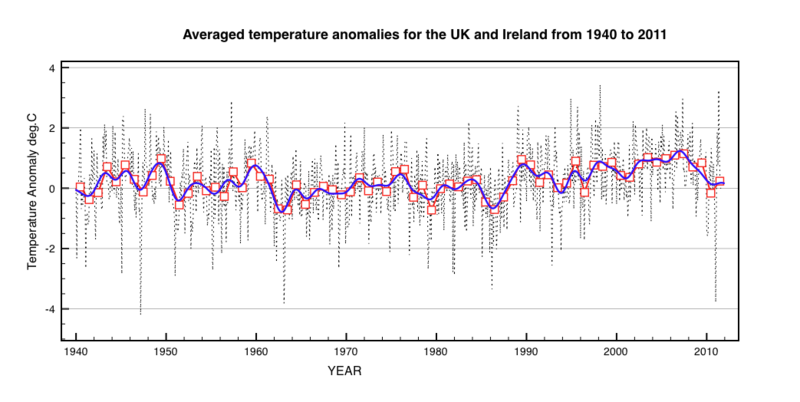 Figure 2: UK average temperature anomaly 1940-2011. The blue curve and the red points show the annual variation. The dashed curve shows the monthly variations. In 2006 China increased CO2 emissions over 2005 levels by 545.2 Mt, while in the same year total UK emissions were just 535.8Mt. The 2008 climate change act aims to cut UK emissions to 20% of 1990 levels by 2050 at a costs of hundreds of billions of pounds. It will have no effect on UK temperatures and globally its effect is also insignificant. The UK’s contribution over 40 years will be to offset just 1 year of increases in China’s CO2 emissions. If on the other hand the aim is to curb UK dependence on fossil fuel imports, then it would be far better to invest just a fraction of this money into nuclear fusion. Only high power densities can replace fossil fuels, and the only non-carbon alternatives are nuclear fission and nuclear fusion. Renewables like wind and solar will always have far too low power densities to be of any significance. This entry was posted in Climate Change, climate science, Science and tagged Climate Change, DECC. Bookmark the permalink. The UK is one country where climate change would obviously be benficial. If the UK were to warm by a couple of degres, Scotland would become more like the Midlands, the Midlands more like the South, the South more like the Channel Isles and the Channel Isles more like Brittany. The agricultural benefits would be significant (and much needed given the growing population caused by immigration) and the UK may even expand its vinaculture. Tourism would greatly benefit. It is difficult to see any serious downside since it is unlikely that overall there would be a significant change in rainfall; with Westerlies coming off the Atlantic there will always be rainfall over the Highlands, Northern England (Lake District) and Wales. Possibly, the South East will become a little drier, but this is just a water management issue. With plenty of water in Wales and the North, it should not be that difficult to manage water supply. In any event, a desalination plant is peanuts compared to the costs of mitigation and there is already one such plant built. Hey it might even mean that less people will be persuaded to retire abroad to Spain Southern France and Italy and this would provide economic benefits since these people have cash to spend. Completely agree. For the UK any slight warming could only be beneficial. So why are we covering the countryside in next to useless wind farms ?